The 6-feet tall bronze statue of Dr. King by sculptor Erik Blome shows him in a pose derived from a photograph of King standing behind his desk, arms crossed, pen in hand, as though he had just risen from his work to greet a visitor. It stands on double black marble base approximately 4-feet high. The statue was set in place in 2003 and created immediate controversy (see Controversies section below). Some black Rock Mount residents thought the crossed-arms pose made King appear “arrogant” and the likeness to King’s face was questioned. The statue dedication was first delayed and then the statue removed and placed in storage. The city tried to hire another artist who created another model but some argued it still did not look like Dr. King. Despite some continued dissatisfaction the original Blome statue was reinstalled and dedicated in 2007. Martin Luther King, Jr. first uttered the phrase “I have a dream” and some of the themes associated with his famous speech during a public address at a Rocky Mount high school gym two months prior to the January 1963 March on Washington. A copy of this speech was discovered and restored in 2015 by the NC State University English Professor Jason Miller. The statue of Dr. King engendered controversy from the moment it was installed in a predominantly black neighborhood in Rocky Mount, NC. Majority-white city officials felt they had hired a well-known and respected artist, and that they had provided ample opportunity for community dialogue regarding the statue. Residents of the neighborhood felt otherwise. Many were dismayed that the statue’s face did not seem too closely enough resemble that of King and there was outrage that a white artist had received the commission. The project polarized the black and white communities and received international news coverage. In fairness to city officials and Blome, his 1998 sculpture of King in Milwaukee, Wisconsin had been well received, as have his other major sculptures of African Americans to include that of Rosa Parks at the Rosa Parks Museum and Library at Troy State University. Blome explained that “the sculpture is intended to show the figure of Dr. King in an original and different way than seen or expected in previous sculpture. The unique idea is that it takes a studious Dr. King and puts him in the public park setting.” Blome also wrote, “Here he stands powerfully like a rock, pen in hand and in a pose that has the quiet strength and regal quality of ancient sculptures such as the pharaohs of Egypt or other spiritual symbols.” He blamed aspiring candidates for City Council and Mayor for using misunderstanding of the sculpture to fuel their campaigns. The photograph that inspired Blome was Bob Fitch’s 1966 photograph of King in the Atlanta offices of the Southern Christian Leadership Conference. The same photograph was also the inspiration for the King Memorial in Washington, D.C. It provoked the same negative response from a mostly white arts review board, which demanded that the image be softened. Yet a third statue inspired by the same photograph placed in Hopewell, Virginia aroused no opposition. 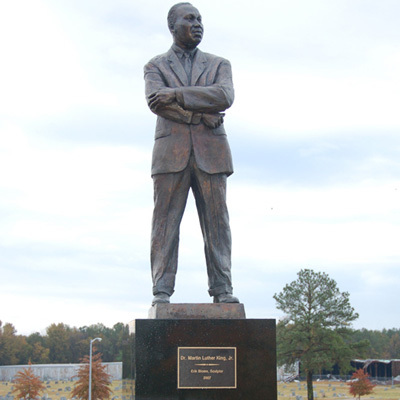 The statue is located in Martin Luther King, Jr. Park at 800 E Virginia St, Rocky Mount, NC. 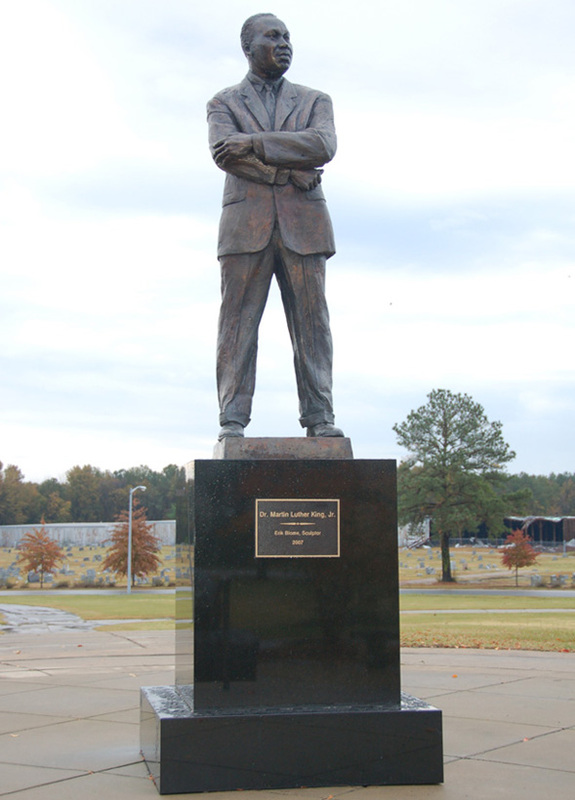 The statue stands in center of a paved circle, in the MLK memorial park in Rocky Mount, NC.